The Science National Honor Society board members promoting their paperless initiative. Many students and staff do not realize the effect that their vast use of paper has on the environment. On the first day of school alone, there are at least 24,500 sheets of paper printed and distributed to students by the administration at Coral Gables Senior High. Add on the fact that at least 28,000 sheets of paper are distributed by teachers with information and that 14,000 copies of progress reports and report cards are printed every semester. In addition to that, the recycling system on campus has proven to be not the most effective. While many have tried to improve the system in favor of helping the environment, the best way to ultimately protect the environment is to reduce the amount of paper used. 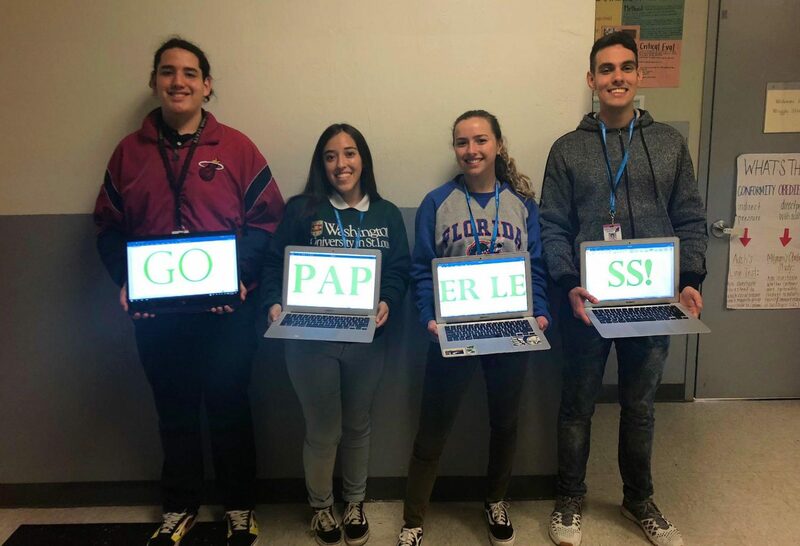 The Science National Honor Society (SNHS) has taken into account the need to reduce the use of paper on campus and thus begun the initiative for the entire school to go paperless! The project began this school year with club sponsor and International Baccalaureate biology teacher Eric Molina, who began offering his students extra credit for going paperless on the parent portal. 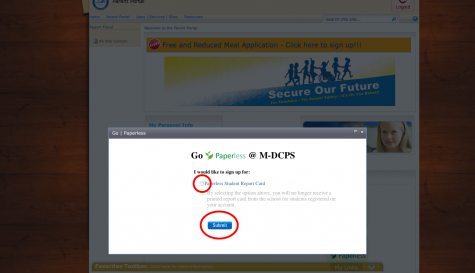 This means the students will now be receiving progress reports and report cards online rather than getting a paper copy. “This paperless initiative will truly help the environment and will hopefully inspire other students to start their own initiatives to reduce the amount of waste humans produce,” Molina said. SNHS has further strengthened this initiative by introducing the idea at staff meetings and were even able to reach out to parents at open house. Members of the SNHS board attended open house and assisted parents in getting access to the parent portal as well as briefing them about the paperless project, prompting them to go paperless as well. Already many students have gone paperless, but the club’s goal is to ensure that the entire school eventually goes paperless. “It was crucial for us to be helping parents at open house as many were not aware of the paperless option or how it works,” SNHS co-president senior Kaylin Yudice said. The next step in accomplishing their goal is a challenge for all homerooms on campus. The homeroom classes whose students go 100% paperless will be entered into a raffle to receive a Starbucks gift card. The hope of the challenge is to encourage more students and staff members to promote the paperless initiative. This SNHS initiative will bring the use of paper down in all departments and hopefully will serve as a model for other schools to follow as well. It is quite possible that it may become a district-wide project and eventually spread to other districts and so forth. This project is highly important and will serve as a catalyzing movement for the reduction of waste on Earth. The Science National Honor Society continues to promote their paperless initiative and hopes to inspire others to begin their own projects on their respective school campuses for the sake of our planet! 1. 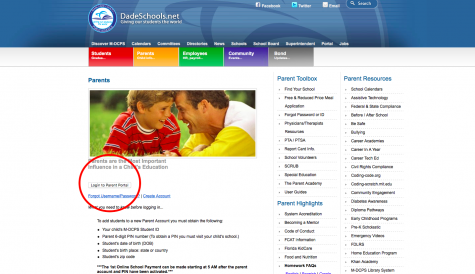 Make a parent portal account if your parents do not already have one. If they do not, they will also need to come to the school to pick up the pin for their parent portal and you may also have access to it through your counselor. 2. 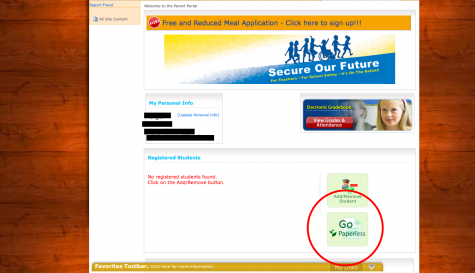 Log in to the parent portal. 3. Scroll down to where it says “go paperless” and click. 4. Confirm to go paperless.